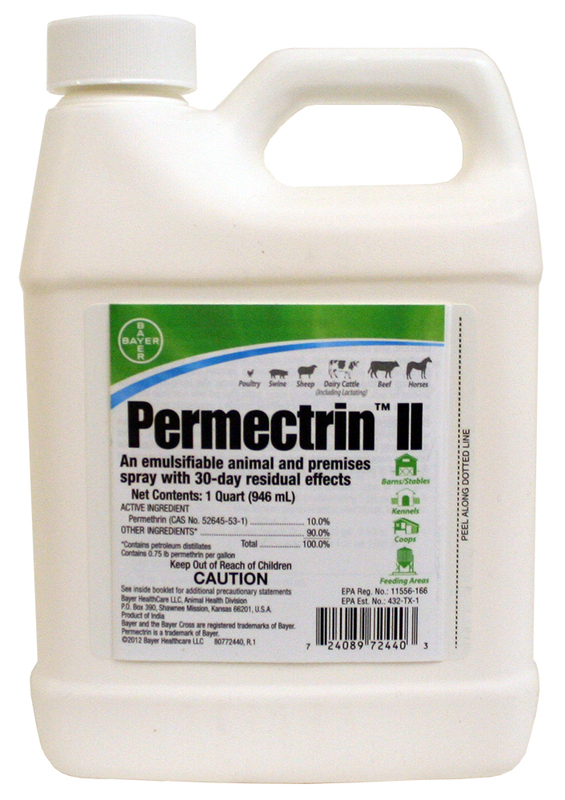 Permectrin™ II insceticide kills flies, lice, mites, ticks (including ticks that carry Lyme disease), fleas, spiders, mosquitoes and cockroaches on horses, beef and dairy cattle, swine, sheep, poultry, dogs and their premises. May be applied as a spray, dip or on a back-rubber. Mixes with water or mineral oil and offers a 30 day residual effect. 8 oz makes 6.25 gallons. 1 qt makes 25 gals. 8 oz makes 3 gallons. 20 mL (4 teaspoons) in 1 qt. water. Not for use on puppies under 3 months. Kills a variety of pests on farm premises including house flies, stable flies, lesser house flies, mosquitoes, lice, mites and ticks (including deer ticks - carriers of Lyme disease). Aids in control of cockroaches, mosquitoes and spiders in and around farm premises. Effective against mange mites and hog lice on swine and mites on poultry. Convenient to apply as a high or low pressure spray, with a hand or garden sprayer or as a spot spray. 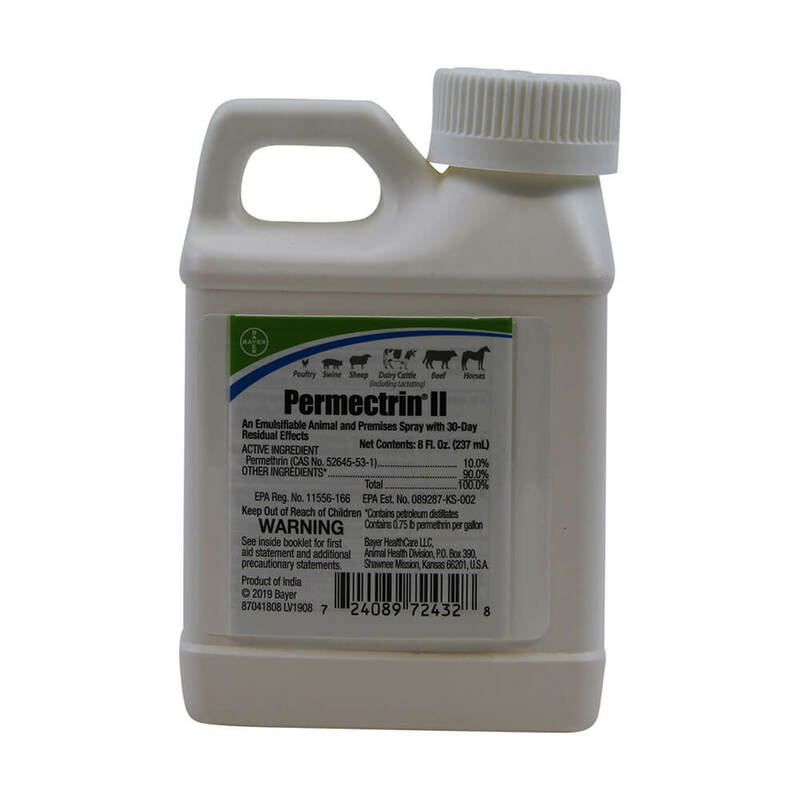 Mix Permectrin II and apply the use-diluted material to animals and pest breeding or resting surfaces at the rates shown on accompanying chart. These dilutions and rates will provide most efficient pest control under conditions of heavy pressure when good contact is achieved. Timing and frequency of applications should be based on pest populations reaching nuisance levels, but accompanying manure removal and sanitation practices should precede sprays. Can be applied in a mist blower or power fogger with water or oil as a carrier. Use as a fog, as a spray or in back rubbers. One quart will treat 200 mature animals as a direct-to-animal spray or cover 18,750 sq. ft. of surface at maximum dosage. Houseflies, stableflies, lesser houseflies and other manure breeding flies, fleas, lice, mites, ticks, including deer ticks (carrier of Lyme disease). Aids in control of cockroaches, mosquitoes and spiders Mix 1 qt in 25 gal; 8 oz in 6.25 gal; 1 1/3 oz (40 cc) in 1 gal of water. ** Spray all surfaces to run-off with diluted emulsion using 1 gal per 750 sq ft.
Use undiluted in mist blower. In power fogger, use 1 qt in 25 gal; 1 1/3 oz (40 cc) in 1 gal of oil or water. ** Mist or fog 4 oz per 1000 sq ft.
Faceflies, hornflies, horseflies Mix 1 qt in 20 gal; 8 oz in 5 gal; 1.6 oz (48 cc) in 1 gal oil* to charge backrubs. Animals self apply. Recharge backrub or oiler as needed. Faceflies, hornflies, horseflies, stableflies, mosquitoes, lice, mites, ticks, including deer ticks (carrier of Lyme disease) Mix 1 qt in 200 gal; 8 oz in 50 gal; ½ oz (15 cc) in 3 gal of water. Spray to thoroughly cover entire animal. For lice or mites, a second treatment is recommended 14-21 days later. Ear ticks, faceflies, hornflies Mix 2 oz (60 cc) in 1 gal oil* or water for spot application. Apply ½ oz per ear or 2-4 oz on face or 12-16 oz along the backline. Mange mites Mix 1 qt in 100 gal; 8 oz in 25 gal; 1 oz (30 cc) in 3 gal of water. Spray or dip animals. Retreat after 14 days spraying walls and floor and replace bedding to kill late hatching, developing stages. Do not reapply product for 2 weeks. Blowflies, mosquitoes, hog lice, fleas, ticks, including deer ticks (carrier of Lyme disease) Mix 1 qt in 100 gal; 8 oz in 25 gal; 1 oz (30 cc) in 3 gal of water. Spray, paint, or dip to apply 1 pint per dog, pig, or sheep, especially around ears. Do not reapply product for 2 weeks. Poultry mites Mix 1 qt in 50 gal; 8 oz in 12.5 gal; 2 oz (60 cc) in 3 gal of water. Spray ½ oz per bird, or 1 gal per 100 birds, directed toward vent area. Spray cages. *Mineral oil or non-irritating organic oil. **1 oz is equivalent to 2 tablespoons or 30 cc. *Contains petroleum distillates. Contains 0.75 lb. permethrin per gallon. Always read and follow label directions carefully. Do not contaminate feed, food or water. Do not use on dogs under 12 weeks of age. Consult a veterinarian before using on debilitated, aged, medicated, pregnant or nursing animals. Do not spray feed, food or water. Do not repeat treatment for 2 weeks. Wash udders thoroughly before milking. Consult a veterinarian before using this product on debilitated, aged, medicated, pregnant or nursing animals. Caution: May be harmful if swallowed, inhaled or absorbed through skin. Avoid breathing spray mist. Avoid contact with skin, eyes or clothing. Caution: Sensitivities may occur after using any pesticide product for pets. If signs of sensitivity occur, bathe your pet with mild soap and rinse with large amounts of water. If signs continue, consult a veterinarian immediately. Call a physician or Poison Control Center immediately. Do not induce vomiting. Vomiting may cause aspiration pneumonia. Remove contaminated clothing and wash affected areas with soap and water. Flush eyes with plenty of water. Call a physician immediately. Remove victim to fresh air. Apply artificial respiration if indicated. This pesticide is extremely toxic to fish. Use with care when applying to areas adjacent to any body of water. For terrestrial uses, do not apply directly to water, or to areas where surface water is present or to inertial areas below the mean high water mark. Do not contaminate water by cleaning of equipment or disposal of wastes. Apply this product only as specified on the label. Keep container sealed when not in use. Protect from freezing. In case of spill on floor or paved surfaces, soak up with sand, earth or synthetic absorbent. Remove to chemical waste area and dispose of in accordance with state and local regulations. Wastes resulting from the use of this product may be disposed of on site or at an approved waste disposal facility. Do not reuse container. Triple rinse (or equivalent). Then offer for recycling or reconditioning, or puncture and dispose of in a sanitary landfill, or incineration, or if allowed by state and local authorities, by burning. If burned, stay out of smoke. Do not ship swine for slaughter within 5 days of last treatment.